Being a 1,600 seat theatre that’s known for presenting some of the biggest touring acts means that we can miss out on presenting some of the up and coming artists whose music inspires us. So, I thought I’d share a few new artists who have not (yet) graced the AMT stage, but we’d love it if they did. This band is an impressive, young group out of America’s Coolest Small Town, Lititz, PA. They cite Neil Young, The Clash, The Band, Tom Waits as a few of their musical influences. And they recently took the internet by storm by getting their live performance of ‘Funeral Beds’ to appear of Reddit’s front page, and a follow-up article on the Huffington Post. After which, their little YouTube video jumped up to nearly 300,000 views. HuffPost said that it’s like My Morning Jacket meets Ryan Adams, but The Districts sound could be described as an edgier Lumineers. Either way, it’s good stuff and worth a listen. Sticking with the rock-vibe, I’m going to circle over to a band that plays homage to the sounds of the 60s-70s, Royal Bangs. Their new album is due out in September and is sure to win you over with its catchy, poppy and pleasing hooks. The band calls Knoxville, TN it’s home and played Tennesee’s heralded Bonnaroo festival in 2008 and 2010. They’re coming to PA soon to perform with Jimmy Eat World at the Mann Center. Performing next week in Lancaster’s own, Chameleon Club, Jason Isbell is a singer/songwriter from Alabama. Jason was in the much-loved group Drive-By Truckers from 2001-2007, and released his first solo album shortly after departing the group. 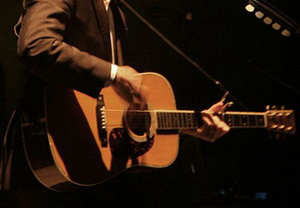 He’s toured with the above mentioned Ryan Adams, and has released a few more albums over the last few years. Most recently, he released Southeastern which has been getting rave reviews from very reputable critics. His tune “Live Oak” was just added to USA Today’s playlist, and he recently performed his tune “Stockholm” on the Late Show with David Letterman.